"These lizards, when cooked, yield a white meat, which is liked by those whose stomachs soar above all prejudices." p. 401, Everyman's Library edition. "Standing on the bare ground, - my head bathed by the blithe air, and uplifted into infnite space, - all mean egotism vanishes. I become a transparent eyeball; I am nothing; I see all; the currents of the Universal Being circulate through me; I am part or particle of God." - Nature, Chapter 1. To the left is the best "Emerson the transparent eyeball" I could find. I remember a more finished cartoon in my high school English textbook. The cartoon is by Transcendentalist poet Christopher Cranch, a friend of Emerson, so I don't think it was meant to mock, although many people took it that way. With the transparent eyeball, the ridiculous and the sublime are right next to each other. But I think it's the very fleshiness of the eyeball that grounds the passage. It's the something to go with the nothing in the next phrase. Put in a more generic word - "vessel" or "conduit" or some such - and the whole passage risks a quick trip to infinite space, as pure hot air. That eyeball gives you something to hang on to. James Wood has criticized Nabokov and similar authors for visually-oriented writing that overemphasizes what can be seen and neglects the rest of the sensual world. Emerson's Nature has the same narrowness - the language is all "seeing" and "eye". Maybe it's just a synecdoche (part standing in for the whole) for the senses in general. But I wonder if an Emerson who preferred music to poetry or birds to stars might have had a different emphasis. Or maybe the language is borrowed from the philosophic sources. Was there a hint, or more, of Kant and company in there somewhere? Possibly in the chapter titled "Idealism"? Help. I wonder if this stuff comes via Carlyle and Coleridge? How was Emerson's German? Or, another theory, is our visual vocabulary (colors and shapes, for example) so much richer than that of the other senses that writers interested in precision are naturally drawn, or trapped, there? All right, I'm looking at the cartoon. The hat is just ridiculous. And the waistcoat. Just as Darwin gains my trust, he makes the outrageous claim that he crosses the Andes from Santiago, Chile to "the Republic of Mendoza". The Chileans check his passport on the west side of the Andes, and the "Mendozans" check it on the east. Joseph Conrad also mentions this mythical country in his story "Gaspar Ruiz" - clearly goofing on Darwin. For shame, Charles. The edition I am reading is about 500 pages. The bulk of the book, 350 pages, is about Argentina and mainland Chile, the Andes and Pampas and Patagonia. The single chapter on the Galapagos Islands is only 30 pages. A surprise to me. There is a very helpful website about Darwin and the Beagle voyage here, with detailed maps. Notice that the map of "Mendoza" is conspicuously absent! *Turns out the common species name is actually "Darwin's fox". Why read an antique, long, semi-accurate history of the French Revolution? Because Carlyle was a great writer. A great stylist, really. He wrote at a very high rhetorical pitch, full of epic similes and exclamation points. Some passages sound like they should be declaimed. Except the weight is undercut by his irony and humor, to the extent that it’s often hard to tell if he means to be taken entirely seriously. (Or, as I suspect is the case with Sartor Resartus, it’s all meant seriously, and the irony is meant not to undercut the ideas but to conceal their outrageousness). Carlyle’s essay on Mirabeau, written around the same time as The French Revolution, is an extreme example of his style – one does not so much read as decode it. Why look, there’s everything I mentioned. E.g., the epic similes: the “Jacobin House of Lords” in place of the Hall of the Jacobin Society, and “Jacobinism”, not an –ism at all but some group of assembled Jacobinists, certainly with fewer than 1,000 throats. The novelistic characterization is good, with Robespierre’s pettiness, ego, and self-pity deftly sketched. The last line is unusually zingy, almost an aphorism. Or a punchline. I can read this sort of stuff at length with great gusto. Modern Library edition, p. 692. The story of Darwin and his condor reminds me of the sadder, more ridiculous case of ornithologist James Kirk Townsend, author of Narrative of a Journey Across the Rocky Mountains, who acquired a specimen (i.e., wrung the little neck) of the only known Audubon's Bunting, never described before Townsend caught it, never seen afterwards. It might have been a sport rather than a distinct species. But still. Is it a scientific honor to collect a unique specimen, or does everyone suspect that you killed the last one? I guess if you really killed the last one the future of the species was not so bright, regardless. In the Journey Townsend describes (and collects) Carolina parakeets and passenger pigeons not so far from where I am now. How nice it would be to see one. They didn't disappear until much later - Townsend isn't responsible for their extinction. 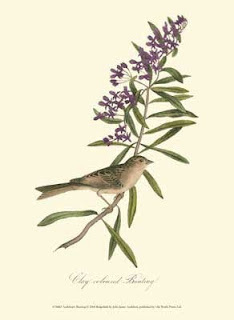 The picture is of a Bunting painted by Audubon. Not necessarily Audubon's Bunting. I'm reading Voyage of the 'Beagle' as a travel or adventure book, not as a science journal. But one aspect of Darwin's scientific background is striking to me. Darwin is in the first generation that could take the concept of "deep time" for granted, that did not have to argue about whether the age of the earth was in the thousands of years, or the millions. The latter position had won the field, and then some. I think even the debates between the Neptunists and Vulcanists were over by the point Darwin was working. So Darwin and his colleagues were out in a world with this new, powerful way of seeing things. Literally seeing - a rock or riverbed looked different to someone trying to deduce its million-year history. Combine this with the Linnaean system, and the flood of specimens and descriptions brought back by travellers from all over the world. Explanations were suddenly available for all sorts of phenomena that had been mysteries for centuries. People were looking at animal and plant physiology, geology, oceans and currents, fossils, almost everything, with new, wide-open eyes. It must have been an incredibly exciting time to be a natural scientist. I thought Stephen Baxter's short book on James Hutton (Age of Chaos) was an excellent amateur introduction to deep time. Amazing to think of great intellects like Johnson or Hume, Johnson pious but indifferent to whether the world started 6 or 10 or 100,000 years ago, Hume dismissing the traditional chronology as nonsense, but neither with any idea, any imaginative conception, of the truth, of an earth that is 4.5 billion years old. "This day I shot a condor". Sort of a shocking thing to read. But Darwin is a scientist, so it's all right. It's possible that the condor is on view at the Natural History Museum in London - they seem to still have the specimen. Regarding the governor of an Argentinian frontier province: "The governor's favourite occupation is hunting Indians: a short time since he slaughtered forty-eight, and sold the children at the rate of three or four pounds apiece". Now this is not just sort of shocking. I have an impression, confirmed here by Darwin, that the crimes of U.S.-Indian policy look a little pale compared to what went on in Argentina. Greed and neglect compared to open genocide. Native Americans and their allies were able to achieve some political success in the U.S., although they lost the fight at most crucial points. But in Argentina, there were no advocates, there was no organization. Just open warfare, or total submission. I need to learn more. A subject for future research. All about Andean condors: pp. 194-8 of the Everyman's Library Voyage of the 'Beagle', the governor's hobby: pp. 140-1. Here we have a fellow Neurotic who has put the contents of "1001 Books You Must Read Before You Die" into a spreadsheet, then generously placed it on the internet as a public service. It has a handy column where you can check the books you have read, and the percentage is calculated for you [mean comment about not bring able to calculate the percentage of 1000 redacted]. Ma femme and I received the first book in this franchise ("1001 Places You Must Go Before Being Cremated") as a wedding present. Besides finding the concept bizarrely, and unnecessarily, morbid**, too many of the PYMG were luxury hotels. My deathbed regrets, I can guarantee, will not involve never having stayed at Sun City. The "or what?" reflex is even stronger with the book on books. If I die without having read Euphues or White Teeth what will happen? Stupid book. *** But of course I looked at the whole thing, compared it to my own lists, pondered books I'd missed, looked up a couple I hadn't heard of. Lists are great fun. If this whole train of thought seems too morbid, it is probably because I am still imagining being guillotined. *My lists for earlier centuries are on paper. ** On the other hand, a book called "1001 Places You Should Go To Die" would be a great idea. Scenic mountaintops, sacred groves, elephant graveyards, that sort of thing. But you can't die in 'em all! *** There's also "1001 Paintings You Must See Before Joining in the Choir Invisible", which includes reproductions of the paintings, so if you just sort of flip through the book with your thumb you can die happy. a King's Life is shorn away. It is Monday the 21st of January 1793. He was aged Thirty-eight years four months and twenty-eight days." Exactly two months older than I am now. Louis XVIth is a tragic figure in The French Revolution, ineffectual and bewildered in his political life, courageous and dignified when tested - at his capture at Varennes, at his execution. A man of some substance, but with no business governing a country. Why do so few kings abdicate? For Louis, it's a failure of imagination, a common enough failing, I suppose. Richard Henry Dana recounts how he read a Walter Scott novel, a surprise discovery from the bottom of a sea-chest during a deadly dull calm, to the rest of his fellow sailors. Most of the rest – some laughed at the “scholars”. Episodes from serials – Dickens, Thackeray, that sort of thing – were read aloud to the whole family, including the servants and maiden aunts, in the evening around the fireplace. Several of my friends read aloud to their partners, or vice versa, on a regular basis. Another friend has said that one of his favorite memories is hearing and reading Trollope on a beach in Malaysia. I suspect more reading is like that of Dr. Grantly in Barchester Towers, snatching bits, when he is alone, of the Rabelais hidden in his desk. Reading is fundamentally solitary, for most of us; certainly for me. Book groups, public readings, that sort of whatnot, all good in their way, but in the end we’re alone with our thoughts. One practical purpose of literature is to help us fight back against Pascal’s aphorism, to be alone in a room with ourselves and not cause too much trouble. This website is my reading journal. Since most of what I read is, or has been recently, or will be 19th century literature, I’ve affixed that label to the top. “Know your audience” is standard advice for writers. What that means when the audience is largely imaginary, I don’t know. But rather than just let my thoughts rattle around in my head, I’ll scatter some of them here. Just the best ones, I promise.